Vaccinium Ashei 'Brightwell' is a fast and moderate growing shrub and fruit bearing plant that can be grown in USDA Plant Hardiness Zones 6B through 9B. It matures to an average height of 5 feet to 8 feet and an average width of 4 feet to 8 feet, depending on climate and other environmental factors. It prefers growing in a location that provides full sun and grows best when planted in sand, loam, clay or silt soil that is well drained. In the spring Brightwell Rabbiteye Blueberry produces white flowers. The foliage is blue green in color. 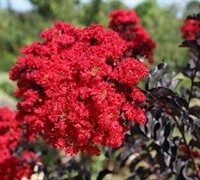 It attracts wildlife and songbirds / birds and is resistant to drought, insects, diseases, mildew and heat. Brightwell Rabbiteye Blueberry can be useful in the landscape in shrub borders, in landscape beds or islands or as a hedge and also in cottage gardens or food gardens. 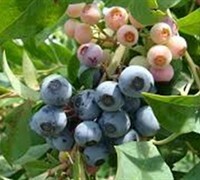 Having trouble choosing the right varieties of Blueberry plants? This is the fun part! 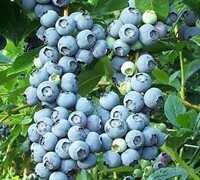 There are lots of Blueberry varieties to choose from - each offering fruit with its own, truly unique attributes. 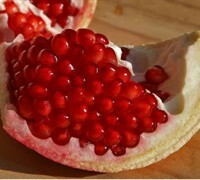 Among these are: Size, Color, Flavor, Ripening Time, Required Chilling Hours, Companion Pollinators, and more. 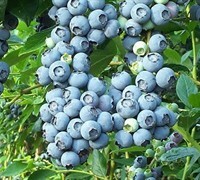 Why not plant an assortment of Early-Mid-Late season varieties, and extend your blueberry harvest season? With just a little homework, you can select the perfect blueberry varieties for your garden - click the link below to use the Blueberry Variety Information Sheet to help make your selections. A 1983, University of Georgia release, Brightwell Rabbiteye is named after esteemed UGA blueberry developer, Dr. James Brightwell, and is considered by many among the top varieties in the world! Best known for its reliability and its long, sustained harvest period (~ 35 days), Brightwell is ideal for almost any planting application. 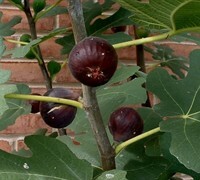 It has very vigorous, upright growth - and because it flowers late, it is highly resistant to freeze damage. 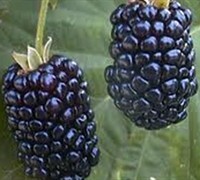 Brightwell is a heavy producer of medium size berries, with excellent flavor, and dry stem scar. 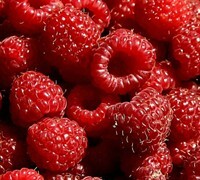 It is also known for its very firm, uniformly round berries - a favorite for mechanical harvesting/commercial processing. One if the largest blackberries of them all! 4-5'H x 3-4'W. Full sun. USDA Zones 5a-8b.